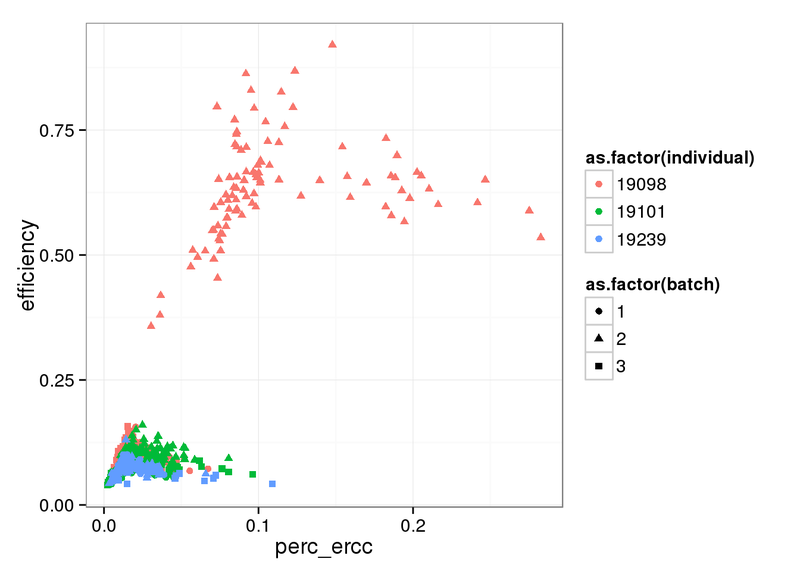 Here capture efficiency is defined as the fraction of the added ERCC spike-in molecules that were sequenced. 23 have greater than or equal to 1,024 molecules. Invitrogen provides the concentration of each ERCC spike-in in attomoles per uL. PoYuan diluted mix 1 1:2500. Then she combined 1 uL of this 1:2500 diluted mix with 19 uL of other stuff to create 20 uL of lysis buffer. She added 9 uL of lysis buffer to the C1 chip. Each well received 13.5 uL of lysis buffer. How many molecules do we expect each sample to contain? Pollen et al. calculated that they had 28,000 molecules per sample. Thus our estimate of 16831.3 seems reasonable, especially since we diluted our samples more. 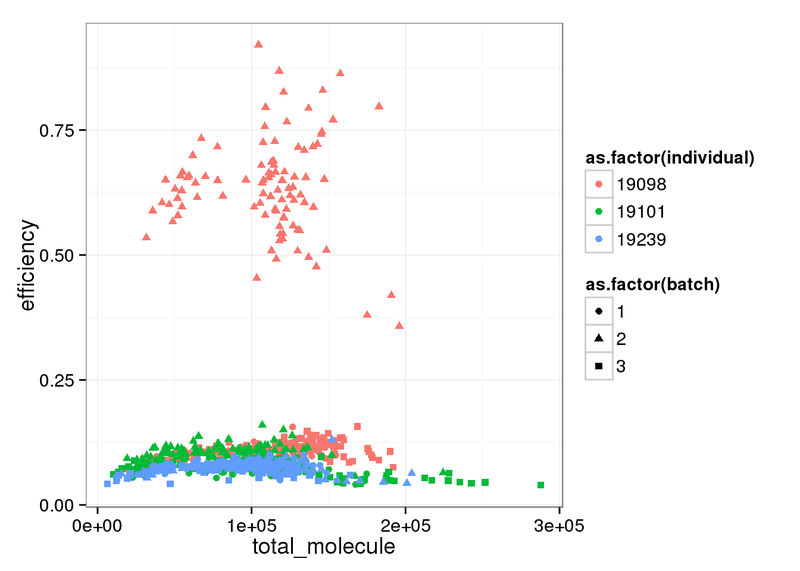 Save the expected number of molecules per well. 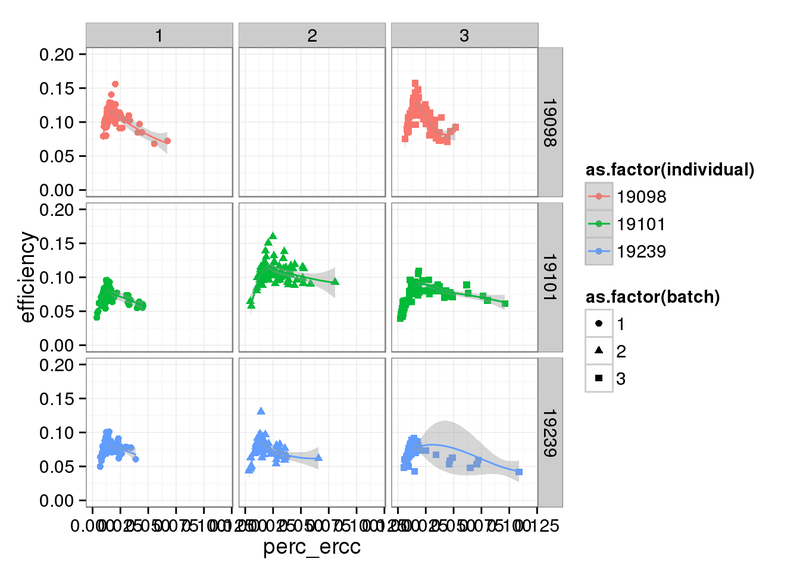 84 of the ERCC spike-ins had at least one molecule observed in at least one of the 864 single cells. The “capture efficiency” is defined differently across studies. Some use it to report the number of wells that had exactly one viable cell out of the possible 96 on a C1 chip. 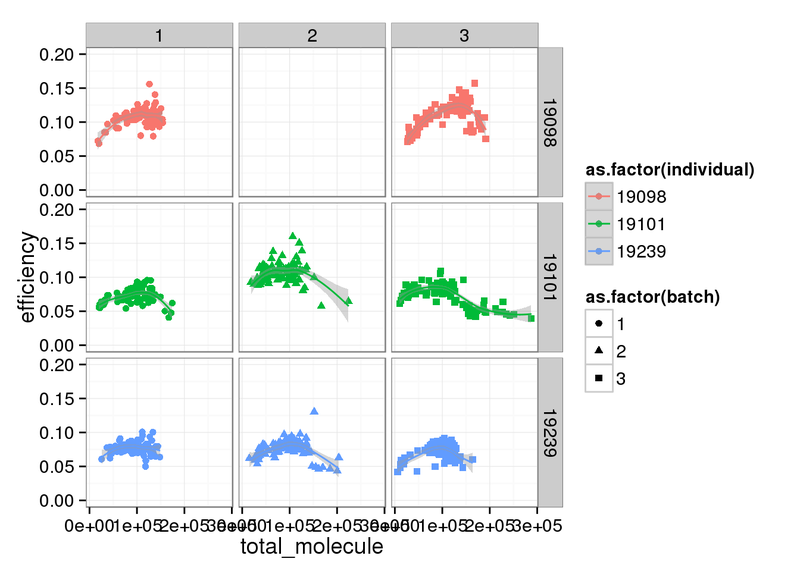 Others use it to report how many of the added ERCC spike-in molecules were successfully sequenced. We are using the latter definition. Thus after calculating the total number of expected ERCC molecules, I simply add up all the ERCC molecules observed for a given single cell and divide it by this total. 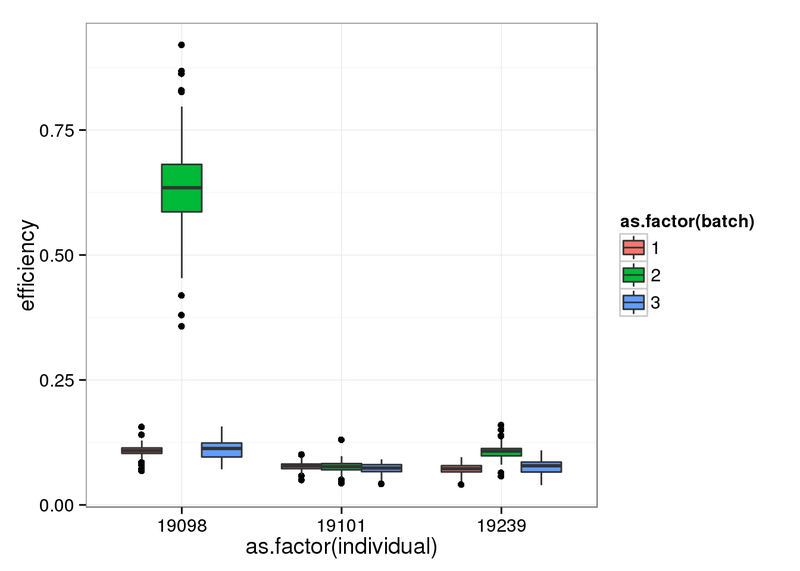 Single cells from batch 2 of individual 19098 ahve the highest efficiency. This was expected since they have an abnormally high ERCC ratio. Removing batch 2 of individual 19098. 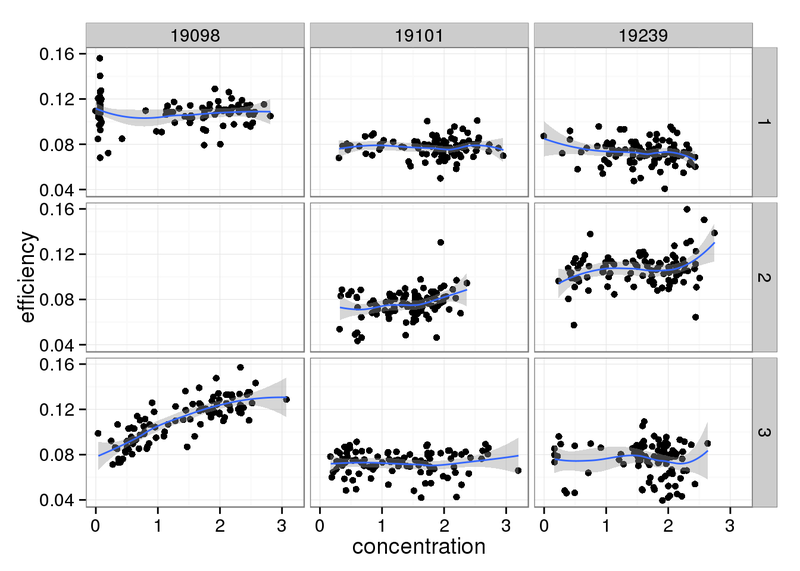 There doesn’t seem to be a relationship between Bioanalyzer concentration and capture efficiency. And this does change when limiting to high quality cells. The capture efficiency decreases with increasing cell number. 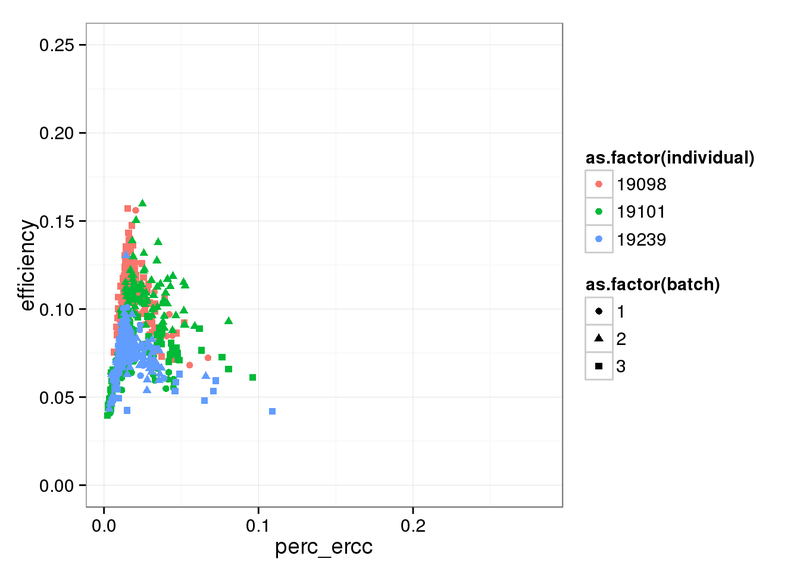 This is expected because the more RNA that is present in a well, the ERCC spike-ins are a lower percentage of the total. However, this effect is not striking. 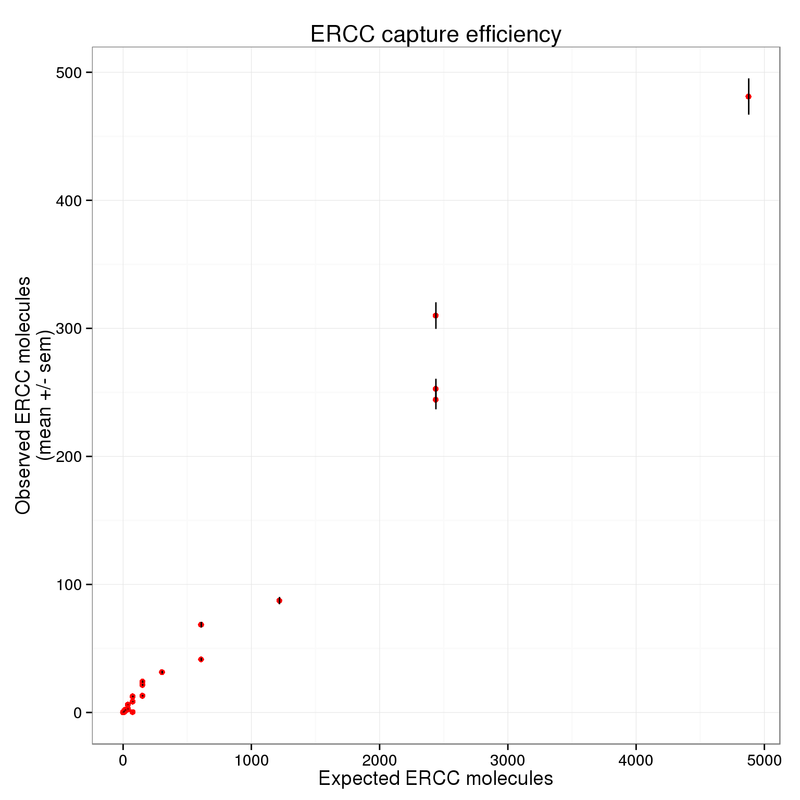 Comparing capture efficiency with the percent of total molecules that are ERCC. 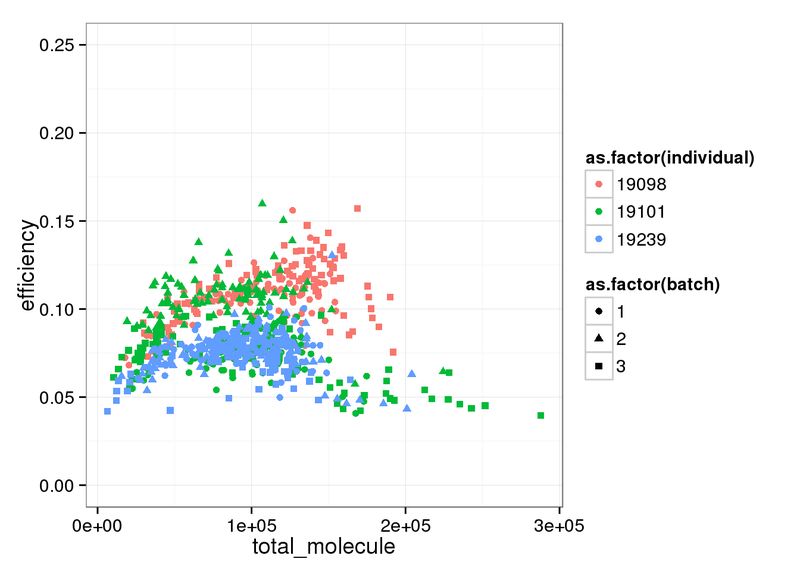 As expected, there is a relationship between the percent of molecules that are ERCC and the capture efficiency. Also, it appears this is another technical difference between the individuals. 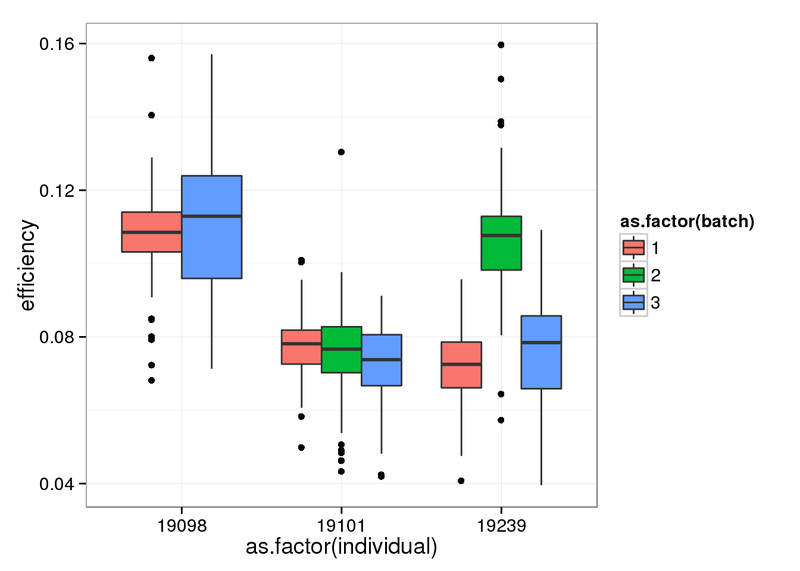 Focusing on the lower part of the distribution, which ignores the outlier batch 2 of individual 19098. 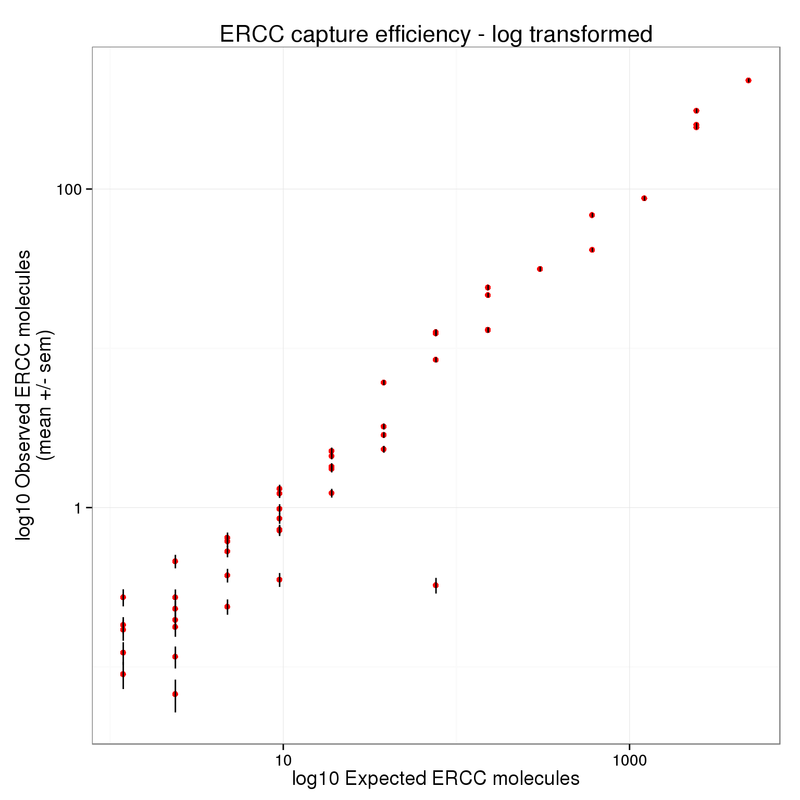 Comparing capture efficiency with the total molecules, both ERCC and endogenous genes. 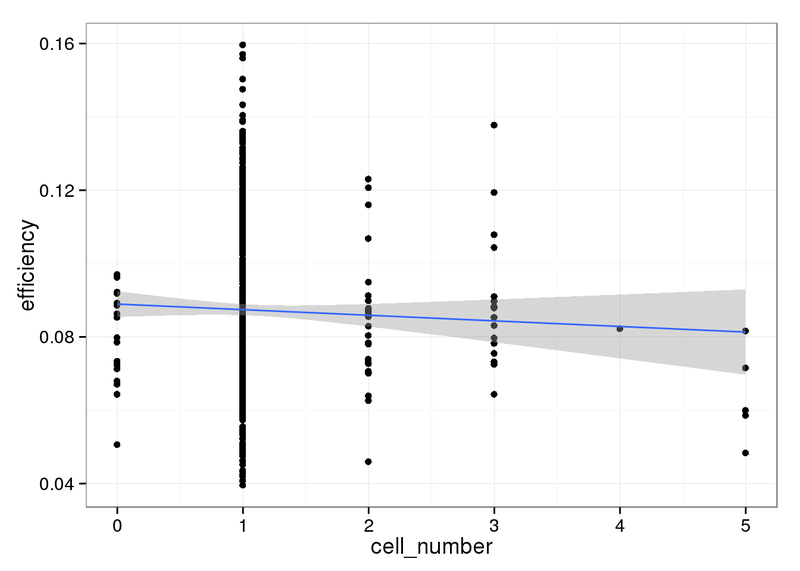 Creating a visualization similar to Figure 2I in Islam et al..
First filter to only keep quality single cells. 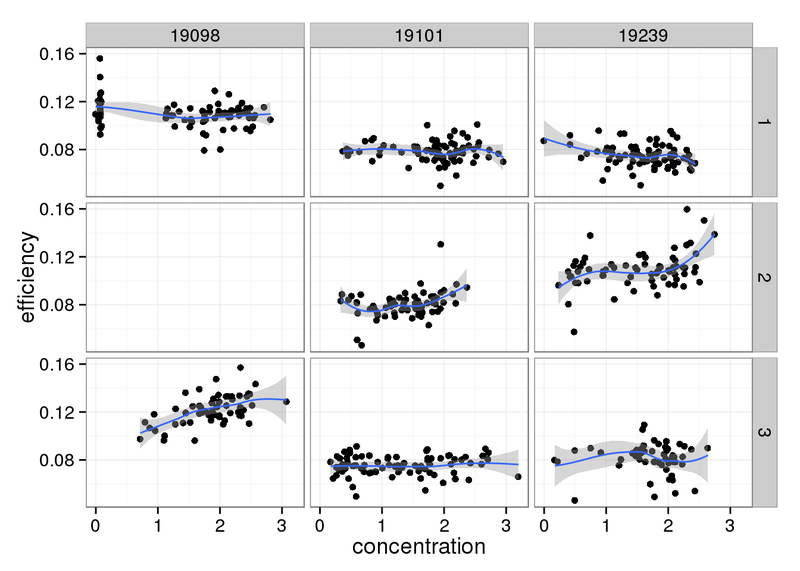 There plot appears to be log-transformed (it doesn’t explicitly say this in the axes or legend).